Course Website: Official Website - Visit Rich Harvest Golf Links's official website by clicking on the link provided. 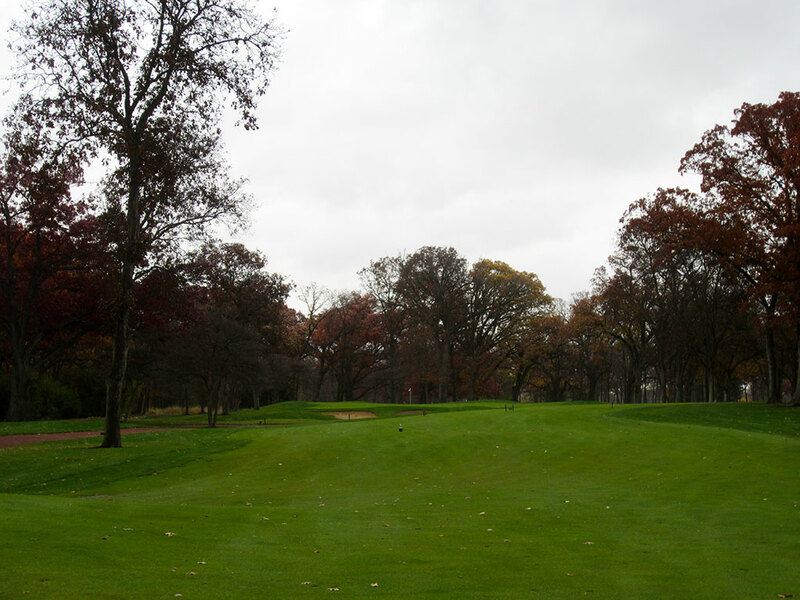 Accolades: Ranked 2nd in Illinois on Golf Course Gurus' Best in State list. What to Expect: Rich Harvest Farms is the brainchild self-made millionaire, golf enthusiast, car collector, and all around great guy Jerry Rich. 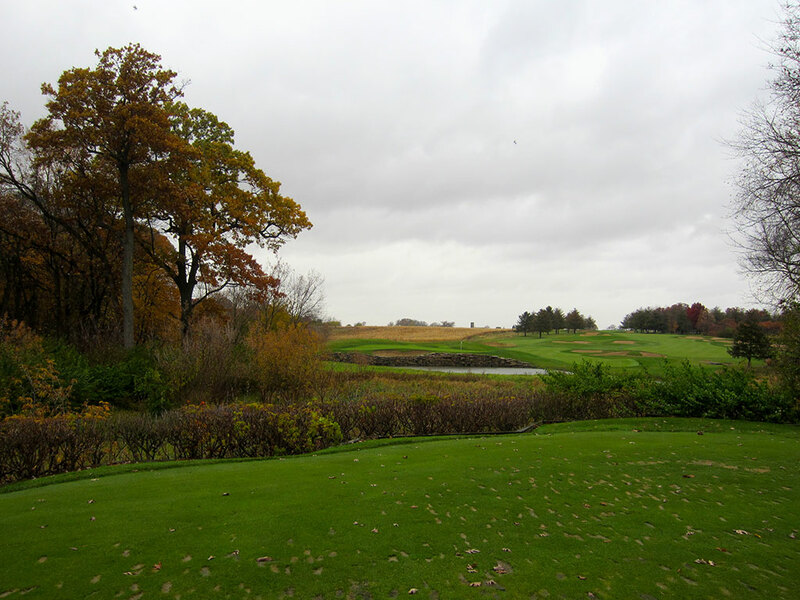 The 1800 acres property originally started with just six holes that played from various tee boxes which modified the par value depending on how you wanted to enjoy the course. 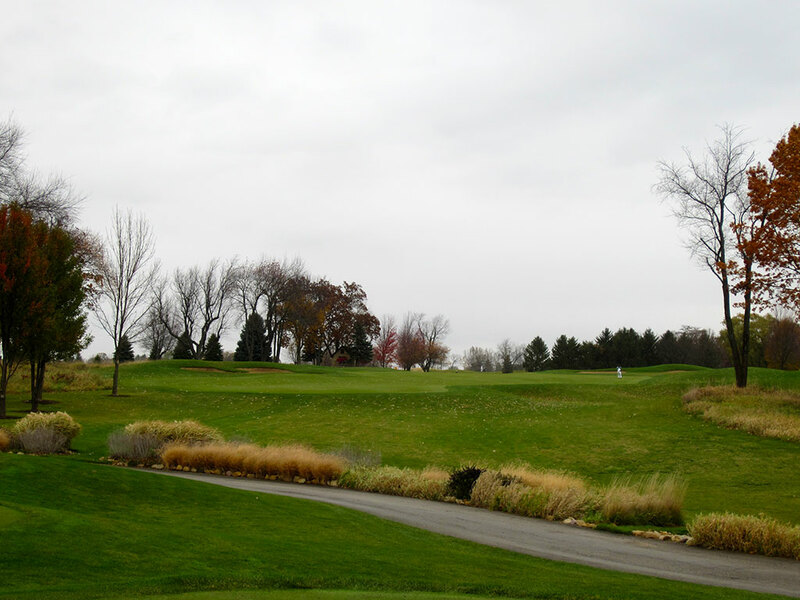 Over time the club grew into nine holes and Mr. Rich requested that Golf Digest begin rating nine hole courses. 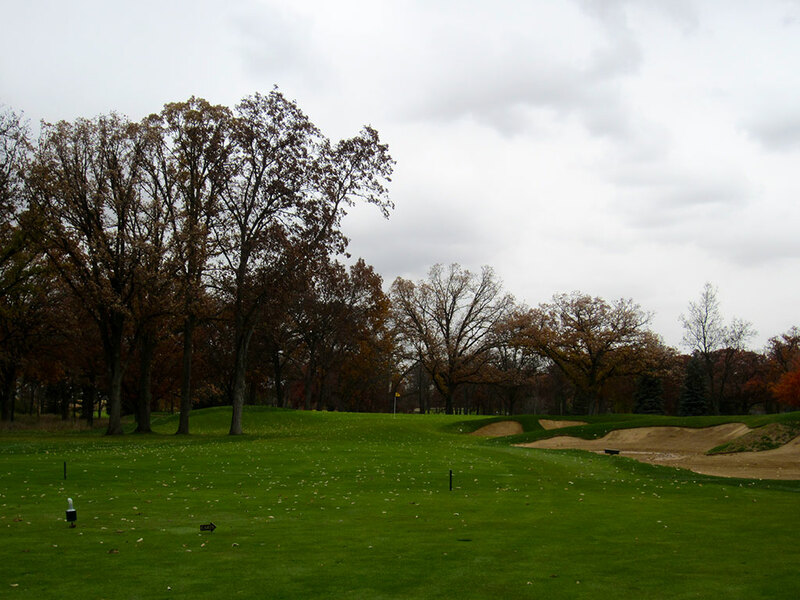 Golf Digest declined the thought and so Jerry took the property to the next level by designing and installing a full 18 hole course that boasts some of the most memorable and enjoyable holes in the golf rich Chicago area. From the aptly named Heavens Beginning hole to the signature Covered Bridge par five, to the challenging Devil’s Elbow hole and wrapping up with The Road Hole, Rich Harvest keeps coming at you with one great hole after another. The Gold nine is tighter than the Silver due to the dense amount of trees on the property. 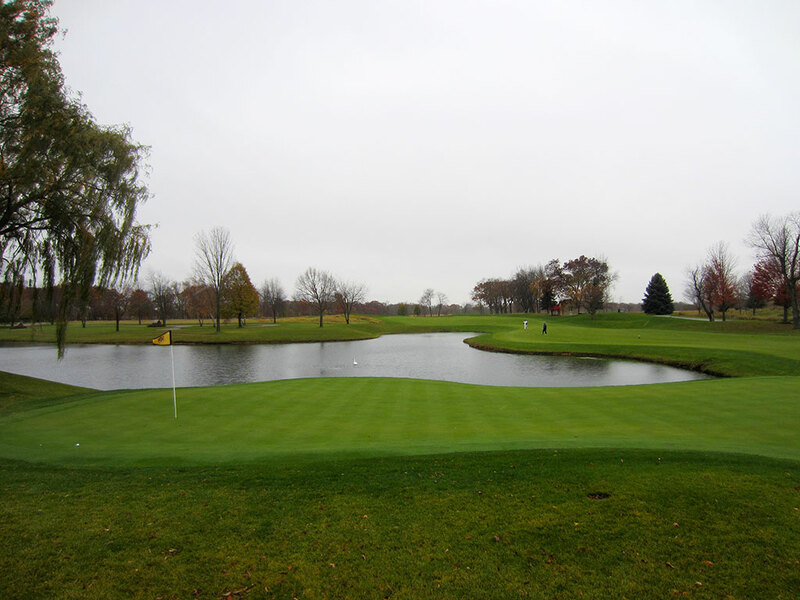 The Silver nine has much more of an open feel with water being featured on each hole thus creating a formidable challenge off to tee, in the fairway, or around the green depending on which hole you are playing. The course features smooth and alluring elevation changes throughout which are easily navigated on foot but provide extra depth and excitement to the track. Fescue grass teams up with the numerous bunkers to create trouble for the wayward golfer while the conditioning of the fairways and greens are primo; not a huge surprise given the limited membership. I knew very little about Rich Harvest Farms before my visit and thoroughly impressed by every single aspect of it. From Mr. Rich, to the beautiful course, to the professional caddie and service, to the amazing hamburger on a pretzel roll, and finally to the most impressive collection of luxury cars I’ve ever seen in my life; Rich Harvest instantly became one of my all time favorite places. Signature Hole: 9th (Covered Bridge) Hole – 545 Yard Par 5 – Rich Harvest is chuck full of fun, memorable holes with the 9th being my favorite. 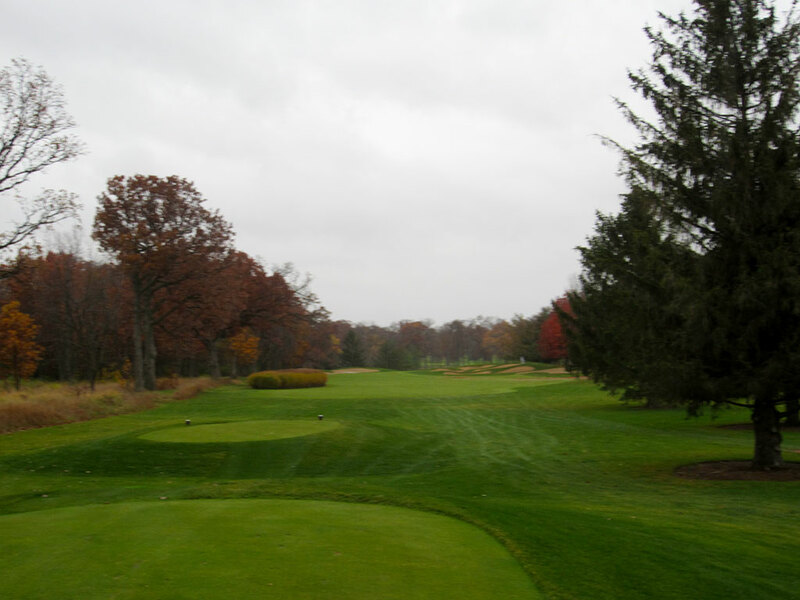 From the tee, the hole is rather unassuming as you are greeted with a slightly uphill shot to a rising fairway. After cresting the hill, the hole opens up to a three tier fairway that presents a variety of options. Approaching the hole from the right side is the best angle for chasing a ball onto the green but also brings into play the trees that encroach into the fairway 120 yards from the hole. Coming in from the left side the holes generally plays shorter, especially if your tee ball is able to catch the slope and work its way down to the lowest tier. After carrying Welch Creek, three bunkers are in your line approaching the green at its shallowest depth. The namesake of the hole comes from the covered bridge that crosses Welch Creek on the right side of the hole and adds additional character to all already unique and enjoyable hole. Best Par 3: 14th Hole – 191 Yards – 14th (Amen - Holy Stone) - 191 Yards - A beautiful green site held up by a tall bank of stones above the water below, the 14th hole is as treacherous as it is attractive. The putting surface is shallow and protected by a bunker in front and a collection bowl in the rear. Chipping from the collection bowl back towards the water will cause even the lowest of handicaps to pucker. 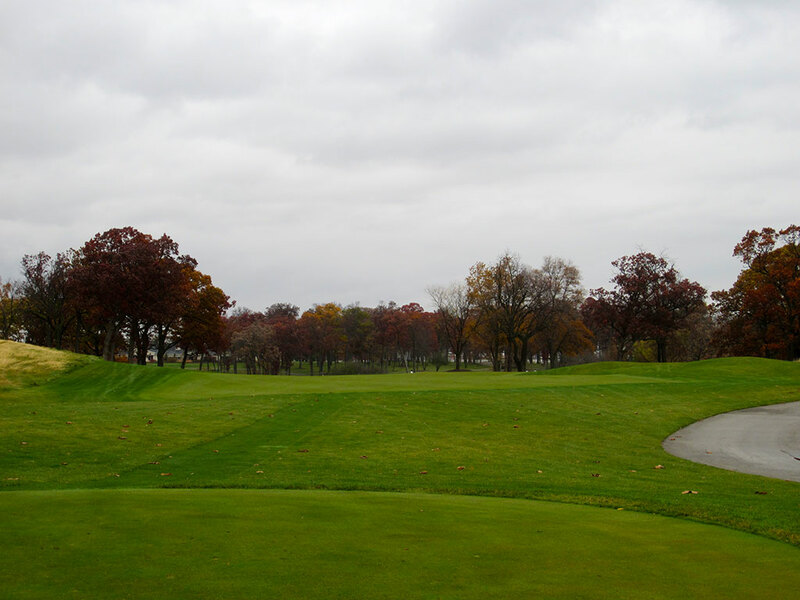 With a serene setting and expansive views, the final par three at Rich Harvest is one of the finest in Illinois. Best Par 4: 8th (The Cottage) Hole – 489 Yards – Like the 9th, the story of this hole doesn't unfold until after getting past the unpretentious tee shot. 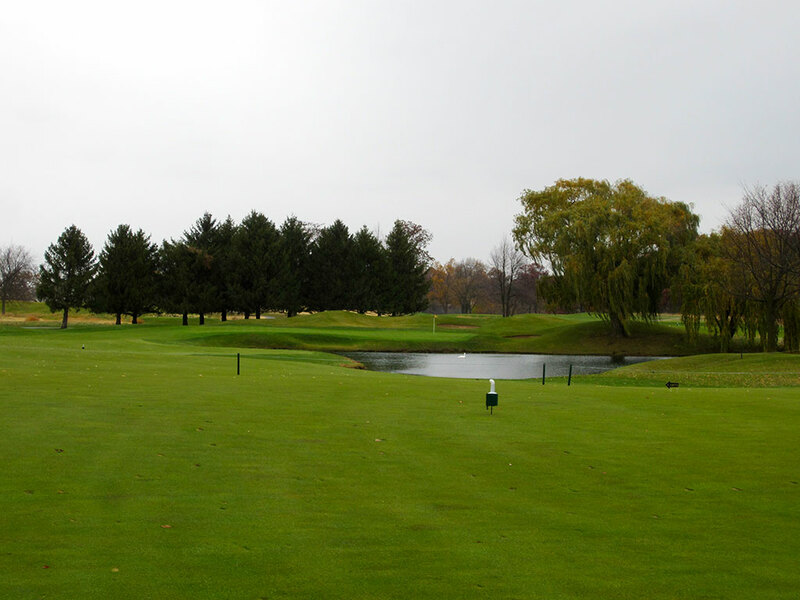 After reaching your tee ball you'll find a challenging approach shot awaiting your best effort with Lake Clyde protecting the front of the green as well as the right side of the fairway beginning 120 yards out. 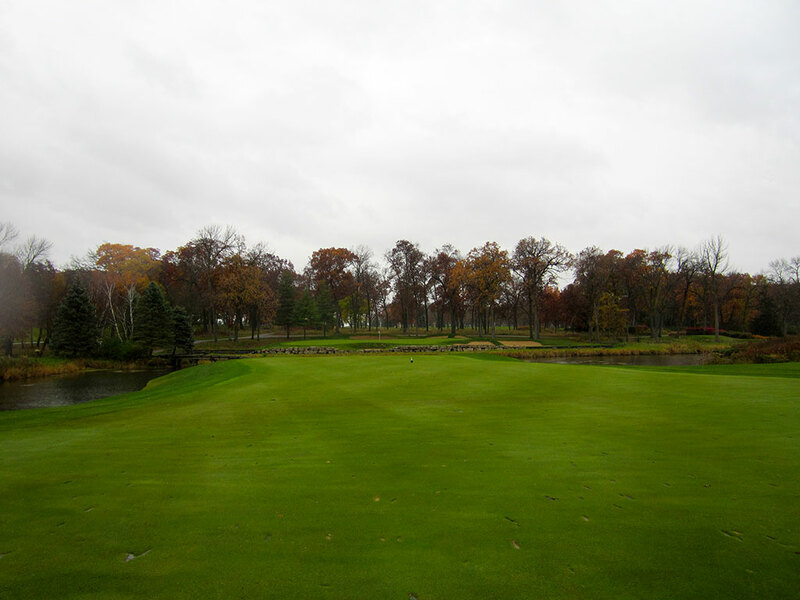 The fairway tightens to a sliver when Lake Clyde encroaches but opens back up less than 100 yards from the hole. As such, laying up is no guarantee of avoiding trouble. The green is slightly raised and the only safe play is long beyond the putting surface. Best Par 5: 16th (Beauty & The Beast) Hole – 634 Yards – With an octet of tee boxes offered, the angle of your tee shot and which of the two fairways you'll be aiming at can change daily. From the tee boxes on the left, the fairway is squeezed down by three bunkers on the right and a single bunker on the left. 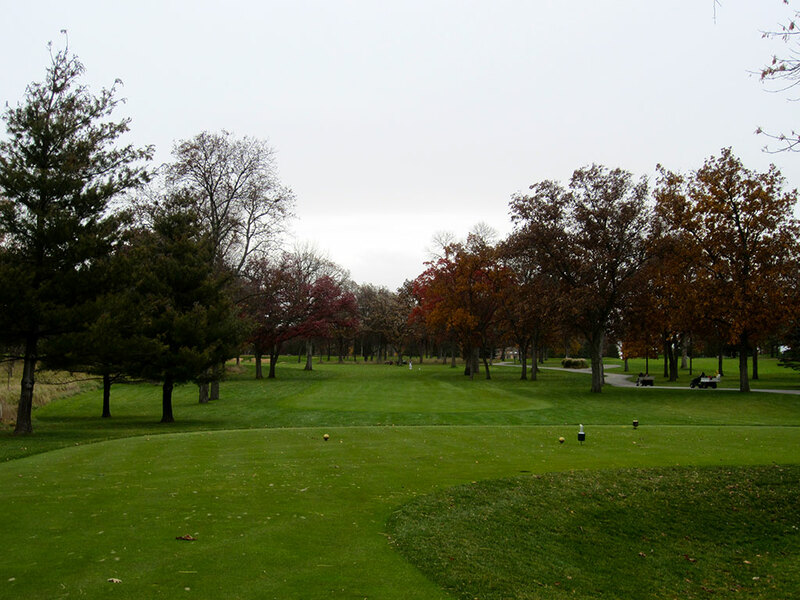 From the fairway on the right there are no bunkers in play but trees line the rough instead. Water cross in front of the green and a small bunker catches ball that are long enough to clear the hazard but run out of steam before reaching the putting surface. No doubt about it, this hole will be the favorite of many players fortunate enough to visit Rich Harvest. Birdie Time: 3rd Hole – Yard Par 4 – 3rd - Yard Par 4 - The only sub-400 yard par four on the course, this hole presents a great birdie opportunity as long as you don't pull a Snead. Nicknamed Snead's Crotch, owner Jerry Rich instructed Sam Snead to hit his tee shot right at the base of the tree located near the dogleg. Snead displayed ridiculous accuracy by having his ball finish precisely at the base of the tree. Snead proceeded to backhand it out of trouble and still managed to get up and down for par. A long iron off the tee or a right-to-left drive will put yourself in the best position to attack the flag of this meekly guarded green. Bogey Beware: 13th (Devil's Elbow) Hole – 462 Yard Par 4 – Featuring one of my all time favorite names for a hole, Devil's Elbow is a dogleg left that is demanding from tee to green. This is by far the most demanding tee shot of the day as it requires all of your length and laser-like accuracy. 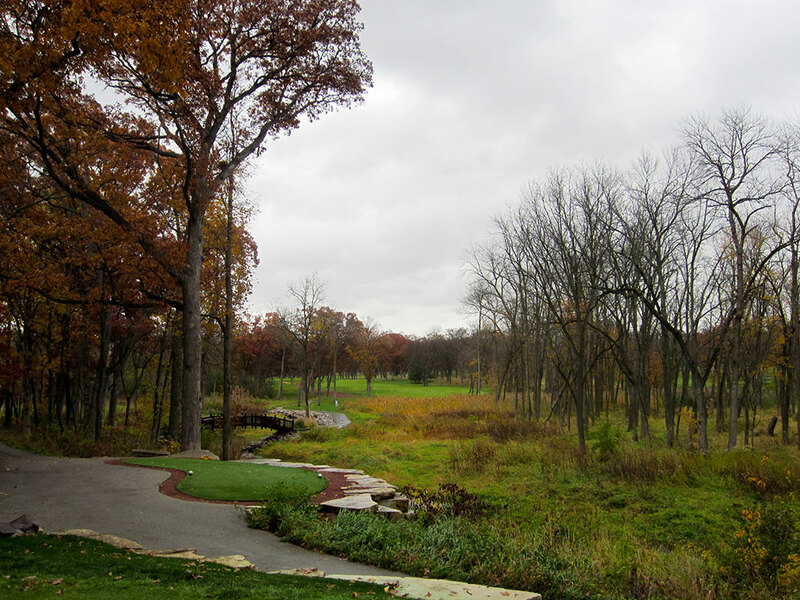 The hole is framed by oak and hickory trees while Welch Creek cuts in front of the tee boxes and meanders up the left side of the fairway. After successfully threading the needle with your tee ball to the small landing area, you are faced with a an approach shot to a slightly raised green protected by a large bunker short and left. This hole was a favorite of mine and flat out requires good golf to get through unscathed.